This on going project began as an effort to identify the parents of Reuben White of Sidney Township. We now know that William White and his wife and Hannah Tomkins, both born in 1751, are the parents of Cornelius, Reuben and Frances (Fanny) White. It is possible that Elizabeth White, who married William Kelly, is also their daughter. A Stephen White who died around 1810 may also be their son. All came to the Quinte area as settlers around 1800. It is possible we have connected the family in Philipstown Precinct, Dutchess County [Putnam County today] as early as 1772 and later in Beekman Patent, Dutchess County in 1790. We have not yet identifed the parents and birthplace of William and Hannah. Thanks to Jon Acker, Jackie Crerar, Peter Johnson, Barb McGill, Jeanne Ross, Bonny Campbell, Linda Smith and Carol Collins for all their work on this difficult puzzle. In 2013, Carol Collins, of Montana, came forward and shared the work of her great grandfather, John Stevenson Barker. He was a genealogist working in the 1890's and he recorded the birth dates of William White as 7 April 1751 and Hannah Tompkins as 6th 6th mo. 1751. He named Cornelius, Reuben and Frances as their children. John S. Barker (JSB) was a grandson of Cornelius White and we consider this source to be reliable. See the White family Bible pages as written by JSB. There is a contemporary land record that states that Cornelius is the "eldest son and heir at law" of the deceased William White. No contemporary record has been found stating that Reuben and Frances are children of William. There is a "Stephen White, of Sidney, yeoman" who witnesses land purchases by William between 1804 and 1809 and then he disappears. No land record has him with a farm in Sidney. Most telling is an 1808 petition where Reuben, William and Stephen White all sign one after the other, suggesting a relationship. It is possible Stephen was a son who died around 1810. Elizabeth White married William Kelly, they lived in Sidney and named their children, Stephen, Hannah, Cornelius, John, Reuben and Fanny. It is possible Elizabeth is a daughter also. Elizabeth died in 1841 so may have easily not been known to John Stephenson Barker when he recorded the family genealogy in the 1890's. We are still working on trying to identify William White and Hannah in NY. We have collected a lot of records and the White records are temporarily on this web page titled: White & Tompkins, Phillipse Precinct. It strongly appears that William and Hannah settled in Philipstown as early as 1772 and in 1783 purchased their farm right beside Cornelius Tompkins, Reuben Tompkins and Joshua Tompkins in Peekskill Hollow. See the web page for more detail. At some point between 1783 and 1790 it appears that William moved to Beekman Patent. Also see the web page Whites Families of Dutchess County 1780 -1800 on this web site. This lengthy page presents an analysis of the 1790 and 1800 NY Census and eliminates all but William White of Beekman, who farmed next to the Tompkin families, as the same man as this William White and his wife Hannah Tompkins who came to Upper Canada around 1800. At the same time we are collecting Tompkins information from the area and presenting it as a work in progress in sections 8 and 9 of this Tompkins web page. When did they come to Upper Canada? William's first recorded land purchase in Upper Canada is in Feb 1804. He did not petition for land and no contemporary record has been found stating anything about how or why they emigrated. John S. Barker states they came from Rhinebeck, NY and settled on the front of Sidney. One benchmark record is the 25 Oct 1801 marriage of daughter Frances White to William Cunningham which may or may not be in Upper Canada. The date comes from a sampler from 1864. William Cunningham is in Upper Canada by 1798 so it is assumed the marriage was in Upper Canada. And then there is the Cunningham account in section 4 below stating that the marriage occured at the home of Reuben White in Sidney and after the marriage they rowed across the bay of Quinte. Better bench marks are the birth locations of two of the children of Cornelius White and his first wife Elzabeth Acker. They are married in NY probably about 1798, and their daughter Catherine is born in 1799 in NY [1851 census] and her sister Frances is born in 1801 in Upper Canada, [1851 and 1871 Census]. Adding to the mix, PLBQ states that Reuben White was born in Schoharie NY. It is possible the family made a pit stop there after leaving Dutchess County but it is more likely that Reuben and his siblings were all born in Dutchess County, NY. If we accept the story that the family all came together from NY, probably Dutchess County, and given the birth records, we can speculate that the family arrived between 1799 and 1801 - thus 1800. The only contemporary record naming Hannah as the wife of William White is a May 1805 land record. William and Hannah White bought farms in Sidney, Hallowell, Murray and Percy Townships so it is clear they came with some money. William White resided in Sidney given that he was always referred to as "of Sidney". Their children are well educated because both Cornelius and Reuben could write well. In Feb 1806, William White "requests" to become a Quaker by way of West Lake Preparative Meeting which was under the Adolphustown Monthly Meeting at the time. He was accepted in June. If William had been a Quaker in good standing while in Dutchess County he would have asked for a "removal" from his previous Meeting. This action suggests he was not a Quaker in NY. In 1810, William was selected as a representative to a committee at the first Canadian Quaker Quarterly Meeting to resolve the issue of purchasing Loyalist land that had been granted for military duty. This was an important committee and his involvement suggests he commanded considerable respect. William was absent for the second Quarterly meeting in August 1810 suggesting he was ill or had died by that time. William dies between 3 May 1810 and 9 Feb 1811. No will has been found for William White or Hannah. In 1823, son Cornelius White requested to become a Quaker at West Lake and was accepted. JSB records Hannah's birth date in Quaker form suggesting that she too was a Quaker. She has not been found in the Quaker records. We do not know when Hannah died - she is alive in May 1805 and it is possible she predeceased William since only he requests to become a Quaker in Feb 1806. However that is a short interval so it is more likely that she became a widow and may have remarried. Tompkin (Tomkins, Thompkins, etc). She was born June 6, 1751. Cornelius, Reuben and Fanny are confirmed as children and Elizabeth and Stephen are possible children. Cornelius White, born Abt. 1776 in USA; died March 06, 1844 in Hallowell, PEC. He married (1) Elizabeth Acker Bef. 1800. He married (2) Dorothy (Dolly) Wetmore Aft. 1807; died Aft. 1844. Elizabeth White, born Abt. November 1777; died April 22, 1841 in Sidney Tp. She married William Jr Kelley; born Abt. 1774 in NY; died 1855. Reuben White, born Abt. 1779 in Schoharie Co., New York; died January 06, 1858 in Sidney Twp, Hastings Co. He married Esther Marsh Abt. 1800; born July 07, 1784 in Manchester, Vermont; died November 09, 1874 in Sidney Twp, Hastings Co..
Francis (Fanny) White, born September 30, 1783; died March 19, 1858 in Prince Edward County. She married William Cunningham October 25, 1801 in Sidney Tsp, Hastings Co. ON; born December 11, 1769 in Dutchess Co., NY; died March 22, 1851 in Prince Edward County. Stephen White - we know nothing of him other than a Stephen is with the family at the start and disappears from the land records in 1809. See the Overview above. William White who married Hannah Tompkins is said to be a direct descendant of William White and his wife Susannah who were passengers on the Mayflower. William White, of the Mayflower and wife Susannah brought their son Resolved on the ship and son Peregrine was the first child born in Plymouth. William White died shortly after and Susannah remarried. Normally these storys are dismissed as wishful dreaming but in this case there may be some truth to the claim. Three branches of William White and Hannah Tompkins descendants have kept the story alive within their descendant line. Mary Phinney, now deceased, of Trenton, Ontario, a descendant of Reuben White, told Randy Saylor, around 2001, that "her grandmother told her the story." Elizabeth White, daughter of Reuben White, married Henry W. Yager and in 1847 they and their children migrated to Wisconsin. In 2005, Don Yager, a descendnat of this line living in the US told Randy Saylor that the Mayflower story had come down through the generations in his lineage. By 1892, Joseph Aishton Barker, grandson of Cornelius White, had moved to Montana. In 2013, descendant Carol Collins informed Randy Saylor that the Mayflower story had been passed down within her lineage. The fact that the story has survived in 3 separated lines of the family gives it credance. It is not verified at this time. The Canadian Society of Mayflower Descendants (CSMD) has housed its library in the Canadiana Room at the North York Central Library in Toronto. Included in the collection is the complete set of The New England Historical & Genealogical Register, 1847-2002, plus a complete index for the years 1847-1994. Also the Barbour's Connecticut Vital Records and the Massachusetts vital records are on microfiche. As well, The Mayflower Descendant, vols. 1-34 are on microfiche, and most issues of the journal after its resurrection in 1985. We have all 21 volumes of the "silver" Mayflower Families For Five Generations books, both volumes of the five generation Howland books as well as the "pink" Mayflower Families In Progress (MFIP) books. All of these are in addition to a wide variety of pertinent New England genealogical and reference books. The Mayflower Families Through Five Generations, Vol 13, by Robert Wakefield, is about the William White descendants, and is a 1997 update of the earlier 1975 edition (Vol 1). The volume, 175 pages, includes all source references of those lines that have been accepted as "proven". Often included are statements of possible descendants that have been proven to not be descendants. In examining the volume there is no obvious link to William White and Hannah Tompkins of NY, given William was born in 1751. Also not included is the line of John White who married Rachel Benson and had Ichabod as a son and Aaron White as a grandson. The fifth generation was typically born between 1700 and 1725 but many lie outside this range. Our William White who married Hannah Tompkins could be a sixth or seventh generation descendant. The hunt continues. There are two sources stating the birth dates of William and Hannah. The most complete is the White family Bible entry made by John S. Barker in the 1890's and mentioned in the Overview above. A second partial source was found in the work of Albert C. Bowerman also recorded in the 1890's. The image and citation is shown below. 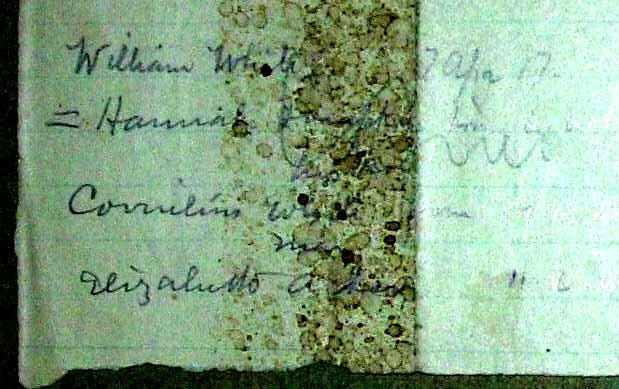 William White 7 Apr 17??. Source: slip of paper, included in the research book of AC Bowerman, c 1904, Marion Cronk Fonds, Folder 5-5, image 11. CYM Archives, Dora Huyck's name is recorded on the back and may be the informant. It is part of the AC Bowerman Notes on this website. On 4 Feb 1804 William White buys from William Smith lot 16, Conc 2, Sidney and it was witnessed by the late Caleb Gilbert and Henry Smith. This transaction is "enregistered by me, Cornelius White of the Tp of Hallowell in the County of Prince Edward administrator to the estate of the late William White for the grantee therein mentioned". Registered 4 Jan 1817 and the documents were witnessed 1 Feb 1817. A William White of Sidney is a witness to the sale of Lot 16, Conc 1, Sidney dated 7 Mar 1804. On 10 Aug 1805 William White, Sidney, yeoman buys for £160 Pounds the east part of Lot 2 and the west part of Lot 3, First Concession Military Tract, Hallowell, PEC from Richard Cartwright of Kingston, merchant totalling 330 acres. On Aug 10 1805 James Geralomay?? and Elizabeth, his wife, Marysburgh, PEC, yeoman, releases 200 acres, Lot 28, Conc 8, Brighton Tp, Northumberland Co to William White, Sidney, yeoman. Witnesses John Stinson, Esq; William Cunningham and James Fulton, Esq all of Hallowell. Reg 10 Aug 1829. Reuben White, William White and Stephen White are all signatories on a petition by Jonas Ellis in support of John Smith requesting a lease to run a ferry across the River Trent. The signatures are one after the other and stregthen the idea that all 3 are related. Stephen White may be a brother to William and he disappears from the record shortly after this date. See the full petition transcribed in section 4 of this web page. On 4 Sep 1840, Cornelius White, Hallowell, yeoman, eldest son and heir at law of the late William White of Sidney sells 100 acres, E 1/2, Lot 28, Conc 8, Brighton Tp, Northumberland Co to John Burley, Ernestown, PEC. Witnesses William Cunningham, Hallowell, yeoman and William Stroughton, gentleman, both of Hallowell. 1808 ASSESSMENT OF THE TOWNSHIP OF HALLOWELL FOR THE YEAR 1808. Wm White purchased lot 9, Conc 2, Percy Tp., Jan 1808 and it was sold by Cornelius White to John Terwilliger May 1817. Arthur Yeomans and Hannah Yeomans, barred of her dower, lot 22, Conc 7, Murray, sale to William White on 26 Jan 1809, Adolphustown. On 28 June 1809, Joseph Rosebush, Sidney, sells to William White, Sidney, yeoman, Lot 13, E1/2, Conc 1, Sidney, 142 acres. Witnessed by Stephen White, and Stephen Tomkins, both of Sidney on 3 Apr 1810. Reg 3 May 1810. On 21 Mar 1809, Ann Simmons, now Ann Porter, Timothy Porter, Christeen Simmons, now Christeen Henesy and James Henesy husband of Christeen and Timothy Porter husband of Ann Porter, Murray and Ameliasburgh Townships sell to William White, Sidney, yeoman, 140 acres, E1/2, Lot 12, Conc 1, Sidney, witnessed by John Smith, Sidney; John Emons, Ameliasburgh; William Ondendyke, Sidney; Stephen White, Sidney; Henry Simmons, Murray and Jonas Lott. Registered 24 May 1820. On 3 May 1810, (Instrument A64), Joseph Rosebush + wife sells the east half of Lot 13, Con 1, Sidney to William White. On 11 Dec 1811, (Instrument C325), Cornelius White sells the lot to Reuben White as the administrator to the estate of the late William White. A memorial dated 9 Feb 1811 between Harvey or Hew or Hugh Fletcher, Sidney, yeoman and Cornelius White, Hallowell, PEC - Whereas the said Hew Fletcher by his two promissary notes of hand or obligation given to the late William White his heirs and assigns in the writing duly executed stand bound unto the said Cornelius White in the sum of £23, 12 shillings and 8 pence, that are dated 12 Aug 1808 and 1 May 1806 and also a book account dated 1 Jul 1810. This debt is against 100 acres, north half of Lot 22, Conc 2, Sydney. To be paid within 4 years to Cornelius White. Registered 1 Nov 1811. Note: Cornelius was the administrator of the estate. See the notes under Cornelius. 20, 2 mo, 1806 - A request to come under friends care came to this meeting by way of Lake Preparative meeting from William White -- Thomas Jones, Philip Dorland and Jacob Cronkhite are appointed to make him a visit on that account, make the necessary inquiry and report to the next meeting their sense respecting the sincerity of his said request." On 19, 6 mo, 1806, the minutes state that "The Friends appointed to visit William White on his Request Report a visit to satisfaction and believe him convinced of our principles and sincear <sic> in his request and don't find but that his life and conversation is orderly after solid consideration thereon this meeting thinks it right to receive him a member and receives him accordingly and appoints Jacob Cronk and Jacob Cronkite to inform him thereof." Jon Acker has found more about the above Hugh Fletcher. In the unplaced Ackerts/Eckerts section at the end of Doherty's chapter he mentions a Nancy Acker of Fishkill who mar. 27 Feb 1803 Mr. Hugh Fatcher. Jon had no luck finding this family in NY in the 1800 or 1810 census. However he found this record of Nancy Fletcher, b. 1780, w/o Hugh Fletcher, Hogle Pioneer Cem, Sidney Twp. This of course is the cemetery where Adam Acker's family and some of the Vandervoorts are buried. No death date is listed for Nancy, and no other Fletchers (though as I'm sure you know this is only a partial listing, containing early burials in Hastings Co. for persons born prior to 1800). Since then, David Stielow has found Hugh and Nancy living in the household of their son James, next door to Vandervorts on the 1851 Sidney census. This alone strengthens the theory, but Hugh's connection to Cornelius White tightens things on so many more levels... Jon feels more certain than ever that this must be the very same Hugh and Nancy "Fatcher" mentioned in the Dutchess Co. marriage record.